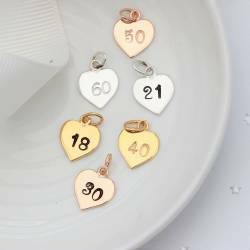 Perfect January, April or indeed any month, birthday gifts for a loved one, this Personalised Birthstone Heart Charm Necklace and Pearl Stud earrings set exudes natural radiance. Featuring a classic box chain beautifully embellished with a silver heart shaped charm, a freshwater pearl, and a genuine natural faceted gemstone. A delightful piece of jewellery, this Personalised Charm Necklace and earrings set can be dressed up or down to suit any occasion and worn with or without the pearl and gemstone cluster to complement your unique sense of style. Pretty, playful, and fully customisable to create the perfect gift, it is a jewellery box essential. It is complemented by a cluster of a genuine faceted gemstone representing the month of their birth, a black or white freshwater pearl. They are genuine faceted gemstones and so the more expensive ones are smaller than the others. The size of the faceted rondel is given under the options for birth gemstones. Given they are natural they may vary slightly from the images shown. The pearl stud earrings will match the colour of pearl you select for the necklace cluster. The cluster is separate from the charm. So can be removed from the chain, you can wear just the letter charm or both cluster and charm together. Each letter is hand stamped and patinised (black finish) so it stands out, or we can leave it silver (clean finish) for a more subtle look. 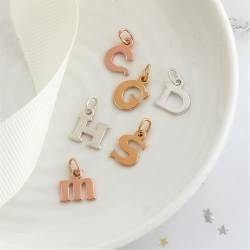 We can only stamp one letter on the front of each charm. Once we’ve created the perfect personalised necklace for you, we’ll carefully package it in one of our beautiful black gift boxes with a birthstone gift card for the month you select. We’ll then finish it with a flourish of ivory ribbon ready for you to give to the lucky lady. The box chain is available in 3 lengths approx 16"/40cm,18"/45cm and 20"/50cm.